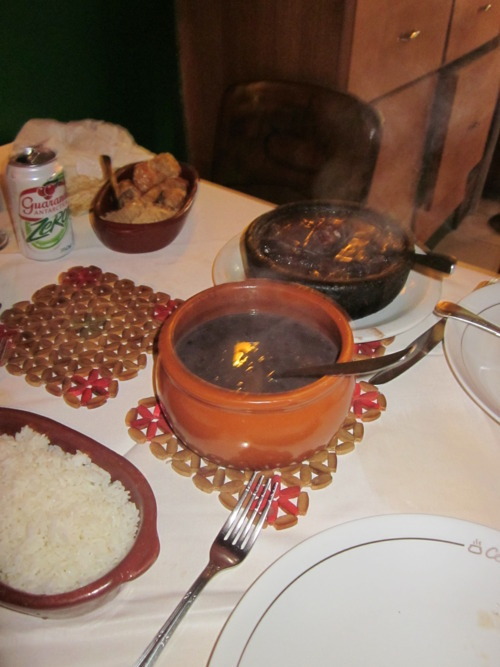 One of the most traditional Brazilian meals you can have is Feijoada. Feijoada is a stew of black beans, beef and pork, normally served with rice, chopped fried collard greens (couve mineira), and farofa. This dish is VERY filling! 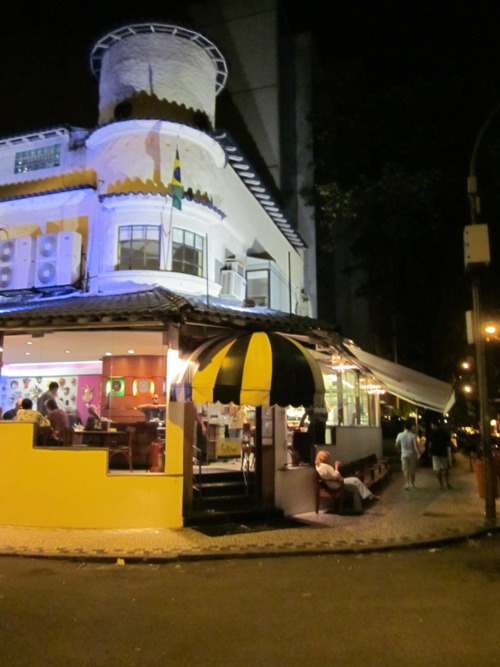 Located in Ipanema, Casa da Feijoada will fix you up some of Brazil’s best feijoada. They start off by giving you a small cup of black bean soup (which is delicious) and some sausage bites. I for one am not usually a sausage fan, but here it is incredible! After a few rounds, they bring out the large boiling pot of feijoada (we ordered ours sans ears, feet etc— FYI if you get it with ‘all the fixins- those will be included! The sides that accompanied this massive dish included more black beans, rice, fried collared greens, yuka fries, farofa and pork rinds (personally not a fan, but people seemed to like them). At the end of the meal they bring over a small ‘sweets plate’ which at first looks like a tasting plate of 3 brightly colored weird substances….. Which turned out to me sweet pumpkin (my favorite! 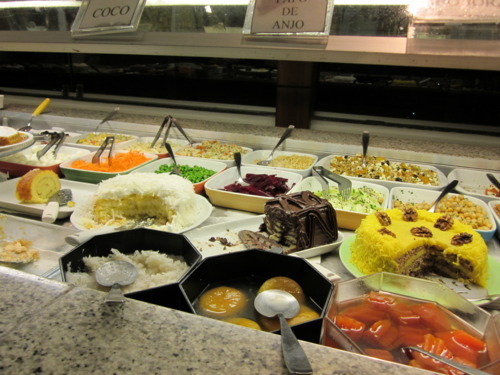 ), purple banana mash and of course dulce de leche (very popular dessert in Brazil). Be a real Carioca and wash it all down with a caipirinha! 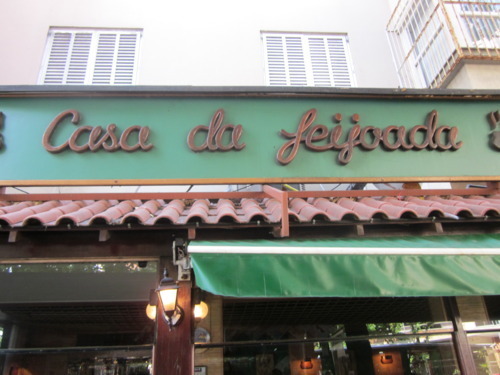 If you go to Brazil, Feijoada is dish you must try! 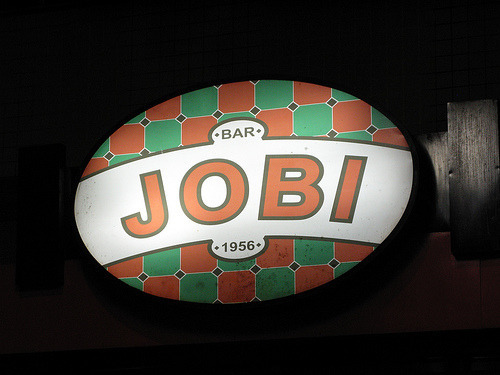 Jobi has been a Leblon institution since it opened its doors in 1956 and is known for having the best ‘chopp’ (light, refreshing beer served with a creamy head in tall glass) in town. Busy every day of the week, it is open from 9am to 4am (5am on weekends), there is always a crowd spilling out of the boteco and on to the pavement tables. Only two blocks in from the beach Jobi is the sort of place you can go to in your bikini straight from the beach, or stop by for an after work/ have a pre-dinner drink or if you are having a great time (which you probably are) spend your night at. 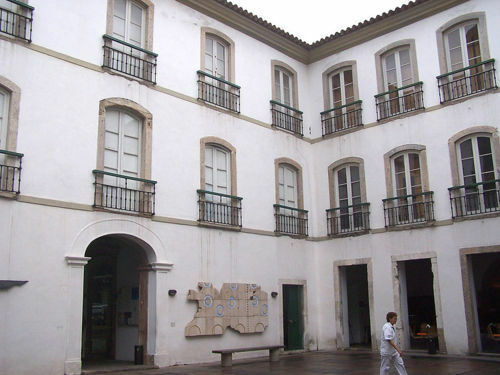 It is packed with businessmen (the only people that wear suits) around lunch time. 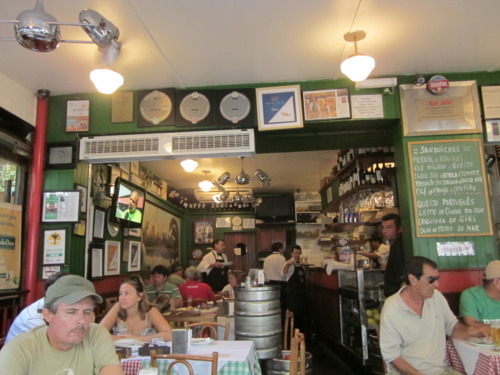 The rumors you are true- in Brazil, people take 1-2 hour lunches no matter where they work! 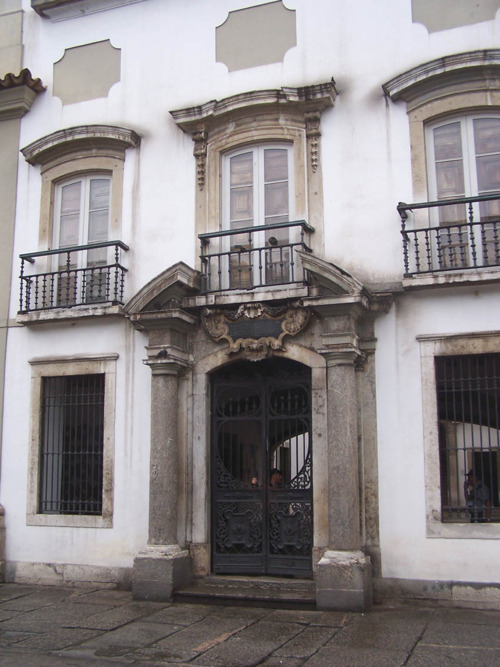 The menu is huge, from sandwiches and salads to full meals; their kitchen also makes some of the best salgadinhos (salty snacks) in town- people always rave about it. 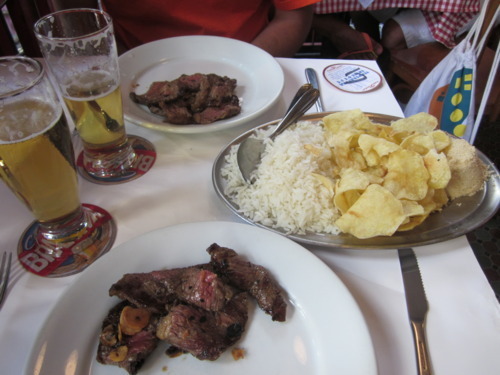 The meals are to share- something that I love about the restaurants in Rio, meaning if you order steak (as shown below) it is portioned for two people and comes with rice, beans, farofa and chips. The ‘chips’ are incredible, fresh right out of the oven! The prime location, relaxed ambiance and delicious bar snacks have combined to make Jobi one of the best-loved bars in Leblon. If you think the salad and hot bar at Whole Foods is good…. you haven’t seen anything like this! 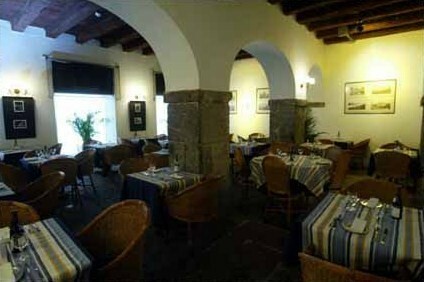 Fellinis is one of the many restaurants that have food ‘by the kilo’. From steak, chicken and fish to rice & beans, pasta, veggies, desserts and more these places have EVERYTHING you could ever want! 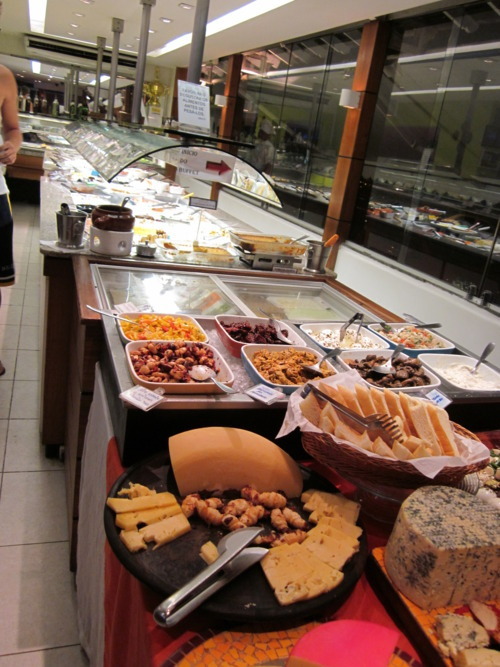 Perfect place to try all the different types of food Rio has to offer. I have been to a few of these places and so far this place is my favorite. With such a large variety it is a real treat! FYI the chocolate cake above is amazing!! !